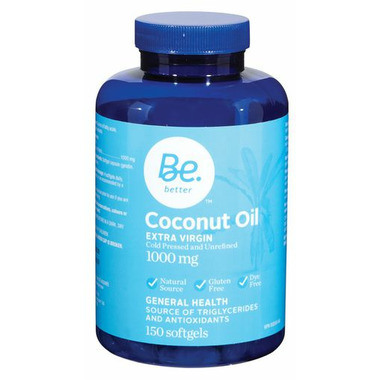 The Be Better Organic Coconut Oil Softgels feature extra virgin, cold pressed and unrefined coconut oil. It is a natural, gluten free, and dye free source of triglycerides and antioxidants to support general health. Dosage: 4 softgels daily, preferably with meals, or as recommended by a physician. Consult a physician prior to use if you are pregnant or breastfeeding.